Due to new Free Trade Agreement among Korea, US and Europe who potentially hold a great impact on trading, Taiwan Government has proposed the Green Industry projects to encourage manufacturers in developing more environmental products that will strengthen our competitiveness through global trading. Therefore, the First Taiwan Green Classic model award was issued to acknowledge manufactures who has spontaneously devoted on this green project. Ever since 1993, Supertextile has dedicated on this going-green project, and first started on recycling plastic bottles in 1997. 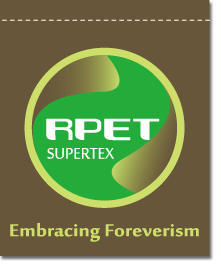 With all efforts on recycling, Supertextile has been recognized gradually and was designated as a pioneer in the recycling field. Together with TSMC, O’right and Far Eastern Century, Supertextile received Taiwan Green Classic award and were invited to share this experience with other manufacturers across all different industries. We are looking forward to create unlimited outcome for win-win situation with scarce resources in hands.